Welcome to “Wellness Wednesday, 03.2018”. These monthly link-ups created by my friend Natalie at Natalie the Explorer are coming so fast. 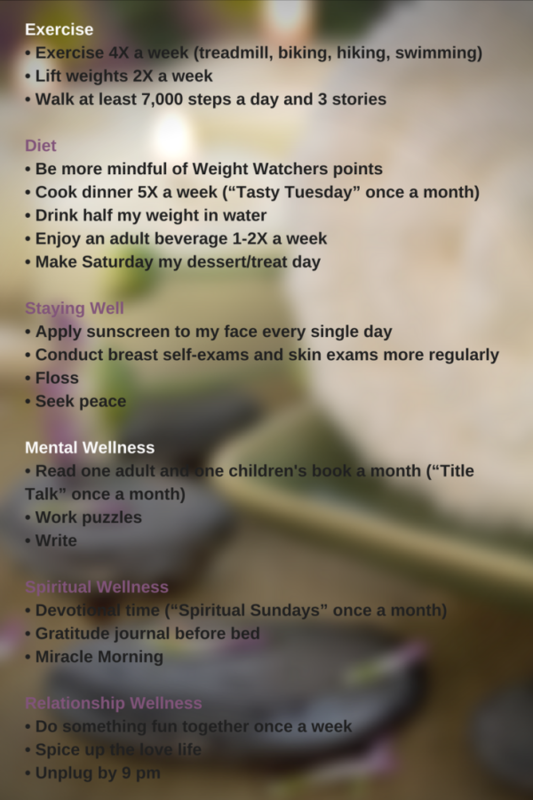 Was so hopeful back in January when I made my list of wellness goals for the year. But two weeks after the first wellness post, I broke my foot. And my wellness journey took a new direction. My focus shifted from running 5Ks, spending more time at the gym lifting weights, walking a minimum 7,000 steps and climbing 3 stories every day. Now I’d have to concentrate on moving as little as possible for 3 weeks, until the doctor released me to begin doing a little more. All of this to say, my wellness train has been derailed by a broken bone at the base of my left pinkie toe. So, there’s not much to report for today’s wellness goals update. Just for kicks, let’s have a look. Rather than going through each activity within each category and evaluating my progress (or lack of), I think I will just rate my success progress for each category on a scale of 1-5. One being no progress and five (probably won’t be many of those) for good headway despite my foot. Does breathing count? Actually, I had begun going back to the gym, riding the stationary bike, walking on the treadmill even using the eliptical machine. Lifting weight and doing crunches. But after my appointment this week, I am taking it easy again. Just hoping I will get my 7,000 steps and 3 stories or floors everyday. I have done fairly well on all of these activities. Really have cut back on my adult beverages. Continuing to cook and drink my water. Preparing Weight Watcher friendly meals. Limiting sweets. Except P’s birthday apple pie, which was so good. Enjoyed with warm with vanilla ice cream on his birthday, and the Thursday and Friday after. Let’s just say I am applying sunscreen everyday. My ‘mental’ hasn’t been too ‘well’. Nor have I been very peaceful. Have worked no puzzles and have written very little. I know, in my right mind, that doing my devotionals and my Miracle Morning routine help me so much. But this month, I haven’t been in a good place. Haven’t been able to keep a schedule. Thought the reason behind my broken foot was to cause me to slow down and cultivate peace in my life. However, I haven’t felt very peaceful. My children are both experiencing some big stressors in their lives. So mama is stressed, too. I was doing really well at unplugging by 9:00 pm but have done a little backsliding lately. Been hard to spice up the love life lately…will leave it at that. But PC and I do enjoy doing fun activities together every week. Room for lots of improvement. Lately, my remote! How sad. 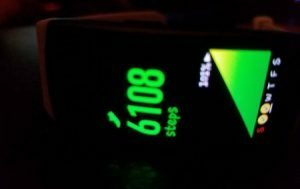 But all seriousness aside, on better days, my Samsung Gear Fit 2 is my fav exercise gadget. My Gear was a gift from my daughters and I love it. 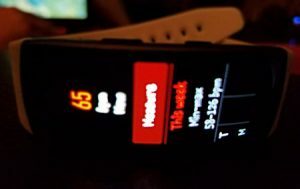 Wore a Fitbit faithfully for at least a year before graduating to the Gear. And I wear it every single day. Here’s what I like best about this exercise gadget. The Gear is a wonderful gadget. 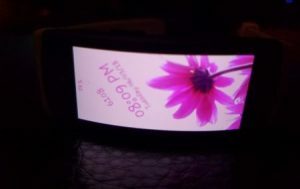 Here are some photos of my Gear faces and screens. No need to clean your glasses or rub your eyes, these photos are just blurry. Sorry. But don’t just take my word for it, check out this review. And bonus…according to the Journal of Health Psychology, 12.08.2014, technology enhancements like the Gear and Fitbit have a strong potential to promote adoption and maintenance of aerobic activity in midlife women. Which supports just what I said. It really, truly makes me move more! How are you doing on those New Year’s resolutions and wellness goals? Do you have a particular success you could share to encourage me? A favorite exercise gadget? Please share in a comment below. And if you are a blogger with a wellness post to share, click below to link-up with us. 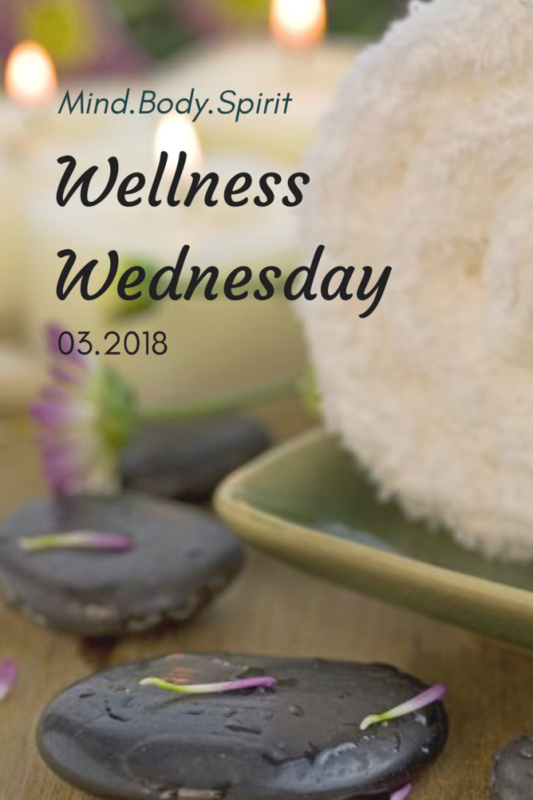 And show some of my blogger buddies some love by stopping by to read their “Wellness Wednesday, 03.2018” posts. Then keep your fingers crossed that this time next month, 04.11, I will be back on track. 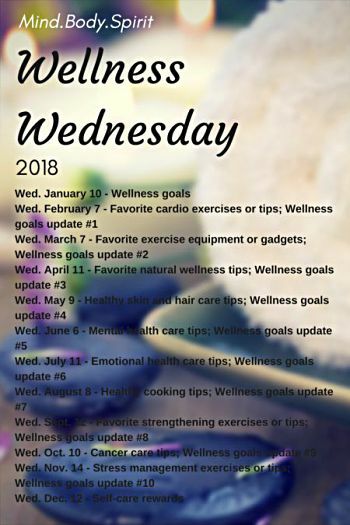 Grab your planner and pencil that date in, and all of the other “Wellness Wednesdays”, for that matter. Adios, “Wellness Wednesday, 03.2018”. To better days over the next 30 days. Salud! Isn’t it just so like us to have the best thought out plans and intentions and then BAM! Something happens? When I broke my foot three years ago, I took it as a sign of God that I needed to slow down. Take it easy and keep your goals in sight! You can do it! I think God was telling me it is finally time to retire. I have been fighting it but when I broke my foot, I lost out on a job and I think that was God telling me enough!! I am just anxious to be able to exercise. Kind of over the work thing anyway! Thank you for the encouragement. Oh no. Your poor foot. Take it easy over there (easier said than done, I know). The gear looks pretty cool. 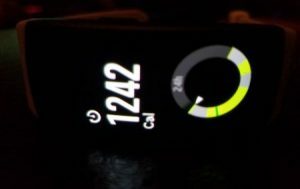 I upgraded my Fit Bit HR to the Fit Bit Blaze because it had many more features. I like it as well, and I like that it vibrates a little to remind me, Hey you haven’t moved in a while, maybe take a little walk. I like that. A gentle nudge. Here’s hoping that your month turns around for you. Oh man, I broke the same or a similar bone in my right foot around 10 years ago! It was my first broken bone ever, and the doctor told me that it was one of the hardest ones to heal. Womp womp. Sending healing, two-footed thoughts your way! 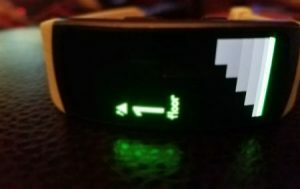 I’m a Fitbit girl myself, but your Gear looks pretty cool! It is good to hear that this is a tough bone to heal. Not that I want that to be the case but it makes sense because it is apparently not wanting to heal very quickly. Did you wear a cast or just a boot? Do you have any trouble with it now? Hope not!! I was a Fitbit girl, too, til my daughters converted me. Thanks for the well wishes. Hi Leslie! You are doing so well despite your setback with your foot. I’m loving how everyone is adding mental and spiritual wellness into their goals. Thanks to you and Natalie for coming up with the idea of Wellness Wednesdays and I look forward to next month’s edition. BTW you do sound like a sports professional having a Sports Medicine Doctor! Aren’t we a fabulous group. Wellness is so much more than just the physical. I am impressed with how we all recognized that, too. Having a sports med doctor sounds so Olympic of me. Like I am some kind of super star runner or something. Ha!! Anxious to get back to my jogging and workouts. Three more days in this shoe!! Woo hoo!! Take it easy, Leslie, until your doctor gives you the green light to do what you planned to do. I know it’s hard to rest but need to be patient until the injury is healed properly. Your Gear sounds very useful. Sending you hugs and wishing you a more peaceful time ahead. Thank you, Natalie. I am such an impatient soul. Not sure it is going to change much but you are right, it is important that I behave myself with this foot. Have had so many women say they suffered a similar fracture. Crazy! Thank you for the hugs and wishes for peace. On my way to see my mom where I can just ‘be’ for a few days in her company. How nice to meet you at Wellness Wednesday. Good luck with the progress you’re making on exercising during retirement. 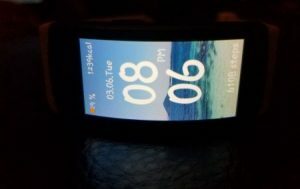 My husband is addicted to wearing his fit bit and guess that’s the best kind of addiction to have. I just do as much as I can without the pressure I feel if I wear one. Please check out my post, #7 Low Cost Colorful Ways to Create an Exercise Habit. Ha! My PC (Prince Charming) thinks like you do. He is doing the same exercise I am for the most part but just lets me wear the device! So glad to meet you and sure enjoyed the great tips you shared for this post. Hope you will join us again.